Combine flour and salt; coat beef cubes. Reserve remaining flour mixture. Place beef in a Dutch oven. Add bacon. Bake, uncovered, at 400 degrees for 30 minutes. Add 1 1/2 cups cranberry juice, broth, and seasonings. Cover and bakes at 350 degrees for 1 hour. 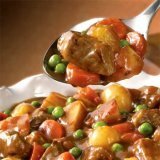 Add carrots and potatoes; bake 1 hour more or until beef and vegetables are tender. Combine reserved flour mixture and remaining cranberry juice and mix until smooth. ; stir into stew. Cover and bake 30 minutes longer. Remove bay leaf. Add peas and return to the oven for 5 minutes.